This is Now. We are Here. Let’s do This! Such is the premise of the new original musical from the creators of the 2008 Tony-nominated [title of show], a musical about writing a musical. I saw a production of [title of show] at Yellow Tree Theater last year, which turned me on to the fictional (?) version of these four talented and wacky friends. So I was excited and grateful to find out that their new show happened to be playing last weekend when I was in NYC, and jumped at the chance to see the real thing. In this Off-Broadway show at the Vineyard Theater (where Scottboro Boys and Avenue Q got their start, as well as [title of show]), they talk directly to the audience and ask for their full attention. What are the odds that the 100 or so people in that theater arrived at that place at exactly at the right time? Slim, so let’s give it our full attention and make the most of the 100 minutes we have together. 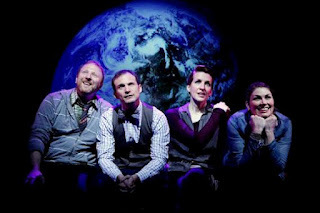 Real life buddies Jeff Bowen (who wrote the music and lyrics), Hunter Bell and Susan Blackwell (co-writers of the book), and Heidi Blickenstaff (who apparently contributes nothing but her amazingly gorgeous voice) play themselves and explore nothing more and nothing less than the origin of the universe, as well as their own personal origins. How we came to be as a species, and how each of them came to be as individuals. They visit a museum together, and try to focus on the now-here-this of it all – being fully present in the moment (inspired by philosopher and monk Thomas Merton). They visit different exhibits in the museum (with some nifty videos showing us birds or turtles or hominids), which serve as the background for each character/actor telling a story about their past (I’m not sure where the actor ends and the character begins in this show). It’s a clever device to get at universal experiences of growing up in this world. Jeff puts on a persona to hide who he really is. Susan fills her days with activities to avoid a home that embarrasses her. Heidi is an over-achiever desperate for attention, always trying to please her stoic lawyer father. Hunter likes to escape into his little fantasy world when reality isn’t so great. There’s something to relate to in each of these characters. For their next project, I'd love to see a musical about how these four very different but very compatible people met and became friends. Like [title of show], Now. Here. This. is hilarious, adorable, and surprisingly poignant. The songs are fun and catchy, and sometimes go deeper than that (I hope they record a soundtrack of the show). I found myself wiping away tears on several occasions, particularly when Heidi and Hunter talked about their grandmothers’ deaths, quickly bringing me back to my own grandmother’s passing two years ago. These are very relatable stories that will make you laugh, cringe, cry, and be happy that the universe brought you to that place at that moment. At least that’s the effect this show had on me. There's no great plot here, just the sharing of very human experiences. We met Jeff and Hunter after the show (the girls had to leave quickly to catch the opening of Peter and the Starcatchers, bummer, because I really wanted to get a picture side by side by Susan Blackwell). Hunter spotted the medals that my friend and I were wearing (we had run a half marathon in Central Park that morning and were dorky enough to wear our medals around town). He shared about when he and Jeff ran a marathon, and he agreed that a race, some good local brew (at Little Town NYC next door to the theater), and a show comprised the perfect day! This was the last of the four shows that we saw in NYC, and it was a perfect ending to our theater weekend. A light but satisfying and surprisingly rich dessert. And just for fun, my favorite song/video from [title of show].